Anything goes well with chocolates really. After banana, strawberry is the next closest thing that goes well with gooeey chocolate. I obviously did not do a good job in making the chocolate sponge cake because it definitely does not look spongy and fluffy. Also, my stupid fridge somehow freeze it a little. It's now chewy and fudge-like but nevertheless, it still taste good! Anything chocolate is good! Note that this recipe calls for a large amount of chocolate so be prepared to stock it up. I happened to have abundance of it you see. 1) Preheat oven to 170°C. Grease well and line the bottom of an 8'' round pan. 2) Whisk Portion A until mixture becomes thick. Fold in Portion B in 3 parts. 3) Pour batter into prepared pan and bake for 25 minutes. 4) Cool 10mins in pan before inverting out to cool on wire rack. 5) When cooled, slice the cake into 2 slices. 6) Melt Portion C ala Bain-Marie. 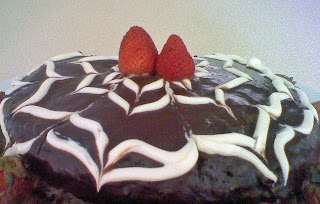 7) Spread it on one layer of the cake and distribute the diced strawberries on it. 8) Top up with the other layer of cake. Use any excess Portion C to seal in the cake crumbs. 10) Melt Portion D ala Bain-Marie and pour it all over the cake making sure it covers all. 11) Chill well before serving. 0 comments on "Strawberry Chocolate Cake"